Mobile is nowadays necessary thing for every comman man, there are lots of mobile operator available in arena with many different offers. Mobile uses increasing day by day, if you have post paid mobile plans then no need for recharge every time but in case of pre-paid mobile plans you have to recharge frequently. In todays fast life it is very tedious to go mobile shop for pre-paid mobile recharge each time, so you many online solutions available, one we have already told you in our earlier article How to free recharge your prepaid mobile in India?, now we are going to tell you that How to online recharge mobile via HDFC bank netbanking by step by step method, This method is only valid for HDFC Bank netbanking customers. 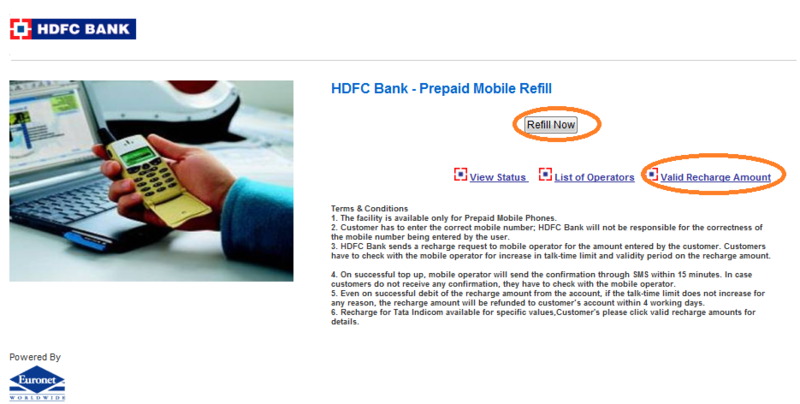 First click here to reach HDFC BANK online prepaid mobile recharge page . Now when online prepaid mobile recharge window opened, click on Valid Recharge Amount to check available recharge option for your mobile operator . Then click on Refill Now link (as Highlighted in picture). Fill your mobile operator details, mobile no. 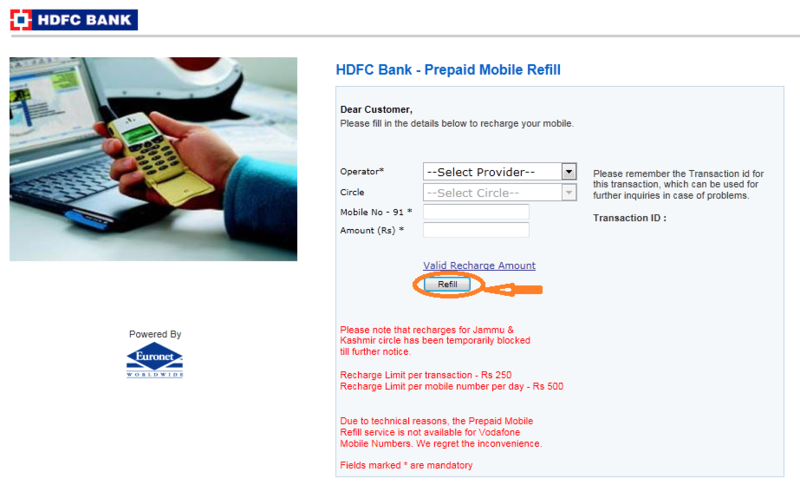 and recharge amount and click on refill(as Highlighted in picture) . Then click on confirm to confirm your filled mobile details for online mobile recharge. You will reach HDFC Bank payment gateway where first you have to fill your HDFC Bank Customer ID . After Login, Select your bank account from Drop down and click on continue. You will ask two security questions, which you have already filled in past. Your mobile will be recharged in few minutes. You can use any prepaid mobile to recharge by HDFC Bank netbanking. Good.I will try recharging my phone now.